Famous Baseball Players .... Had The "Want To"
Famous Baseball Players have become legendary figures of our game of baseball and our country by various and sundry reasons and these reasons is what has also made the game of baseball such a loved and haughtingly wonderful sport. Babe Ruth and Ty Cobb will automatically come to mind when talking famous players of the game. Have you ever stopped to realize that many a neighborhood-kid was famous in his own little baseball playing world? Shall we drop a few names upon you and you will, without question most surely, have to agree these are some of our most famous of the game. "Thinker You Just think About This ! I Could Be Famous One Day If I Can Survive All This Hitting. "Sure Glad I Won't Be Getting Get Smacked Anymore By This Mark McGwire Feller." 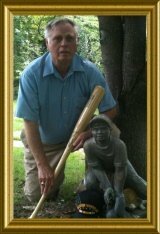 Would even a fictional character fit into our cast of famous within this context of our baseball history. Baseballfarming winners proudly brings to your attention some of the obvious and some of the not so obvious subtle facets of baseball. Casey as in "The Mighty Casey at the bat." Can you find a kid today who has not heard of Mudville and the Mighty Casey? We have the famous the near famous and even the most famous players all of which could cause a heated debate, argument or given the right circumstance a hearty good round of fisticuffs. Jackie Robinson will live forever in the minds and hearts of many for his supreme countenance unflappable grit as the first Black to breakdown the color barrier of Baseball. This brash but humble famous baseball player hailed from Cairo, Georgia and played the game so well his Jersey No. 42 is the only one retired for the entire game of baseball. Often overlooked due to his game changing entrance into Major League Baseball is the fact he was a standout football player at UCLA prior to breaking the color barrier of baseball. Consider for a moment some of the pitchers we could readily size up as being famous playing baseball for their ability to throw a baseball with phenomenal success. The early master twirlers of little baseball would include these two giants of the mound. Walter "Big Train" Johnson---- Denton True "CY" Young. You might go ahead and toss in one or several more of the most famous of the pitching corps the unconquerable Leroy "Satchel" Paige, Don Newcombe, Bob Gibson and Mariano Riviera. Dizzy Dean of the old Gashouse Gang fame takes the cake as a bodacious bragadocious hard chunking legend for saying it and also doing it as a winning pitcher. Harken back to another of the great pitchers of the dead ball era and immediately immediate top and center is Christy Mathewson "The Christian Gentleman." Would you agree these are some pitchers worthy of being called famous baseball players as pitchers? Moving quickly to some famous baseball players brought to mind due to their general exploits of play making. Early years for our game of baseball the well known lyrical phrase "Tinker to Evers to Chance" forever etched upon the wall of time the twin killing combination of these three gents. Tinker, Evers and Chance are the only players ever inducted into The Baseball Hall Of Fame as a unit all three together. Willie Mays "The Say Hey Kid" roamed the center field and made his famous basket catch endearing him to all who ever saw or read of his exploits. This Hall Of Fame great from Fairfield, Alabama grew up playing center field for the Birmingham Black Barons roaming the garden turf in a Field Of Dreams of the Grand Dame of Ballparks historic Rickwood Field Birmingham, Alabama. 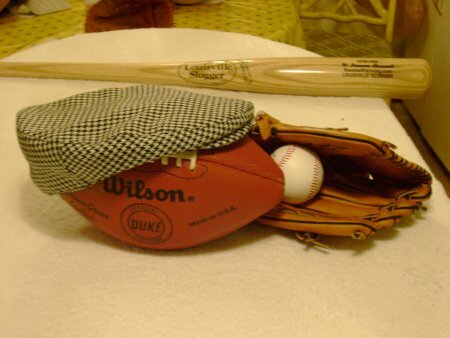 Could you name me a couple or so famous baseball players with the mastery of their swinging his bat or a pitcher throwing strikes which you would only hear the ball whistling as it pounded into the catcher mitt? There are many but to lead the parade here are some to ring your bell Ty Cobb, Babe Ruth, Ted Williams, Jackie Robinson, Willie Mays, Hank Aaron and Mickey Mantle that is a seven card draw that wins most any hand be it stud poker or the crowds frantic cheers. by Vernon Parker (history@brooklyneagle.net), published online 02-05-2010. Shop Here At Baseballfarming You Just Might Save Some Money.